This special issue of Interartive sets out an approach to new media art in Latin America, thus trying to contribute to spread the art practices developed in, from or regarding to this territory, as well as to reflect on the particular conditions for their production, exhibition and consumption. In recent years, the context of the intersections between art, technology and science in Latin America has strongly drawn the attention of the international community. This is probably due to the fact that the global impact of new technologies has re-encouraged the development of these kind of art practices in the region. But it might be also due to a kind of ghost that glides constantly over Latin American new media art when regarded from outside: we are late. The conceptual assemblage of "Latin America" as a homogeneous territory that shares historical and cultural processes, such as colonization, hybridation, mestizaje or diaspora, involves also a symbolic dimension that, for a long time, has linked this territory to the concept of cultural periphery. For this reason, the hegemonic new media art theory and critique, which have usually defined innovation and technological experimentation as an exclusive realm of the "developed" or "First World" countries, has often omitted Latin American new media as a fact. This doesn't mean that there has not been a real art-science-technology practice, nor that it has been isolated from the rest of the world. It doesn't mean, either, that many efforts haven't been done to redefine Latin America's position within the global discursive map of new media art. It just means that the "discursive invisibility" of these practices has hindered, or delayed, the development of a critical approach - both inside and outside of Latin America - able to grasp its distinctive features and to set them in the context of the dominant discourses, without necessary depending on them. Thus, nowadays, as new media art becomes a norm within institutional art, it's more and more necessary to rethink Latin American new media art from the point of view of the frictions that merge when itbs brealityb and those hegemonic discourses meet. However, this is not an easy task, as we are facing a vast field that cannot be taken in at a single glance. 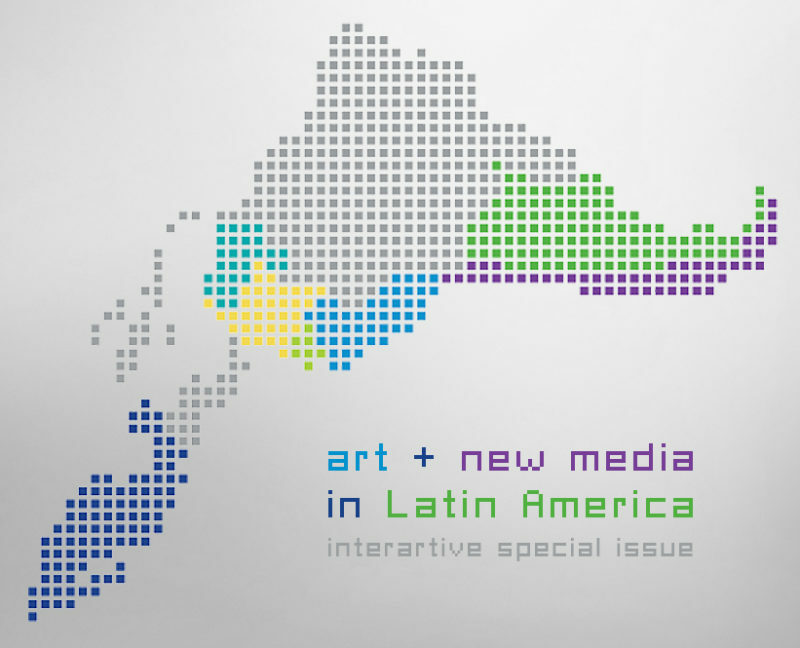 Firstly, because such an idea as "New Media Art in Latin America" is as broad and complex as the realities it refers to. On the one hand, the heterogeneity and diversity that characterize the hybrid practices encompassed by the term "New Media Art" - from net.art to bio-art, all the way to sound experimentation or robotics, among others - open a large field of exploration that is, besides, constantly changing. Likewise, the sphere of new media art is set out not only on a series of specific art products, but also on the whole system of relationships surrounding them, which involve artists, museums, institutions or audiences and, therefore production, exhibition diffusion and consumption processes that interrelate among them. Secondly, because, despite the fact that America Latina is - as already stated- usually perceived as a "homogeneous territory", it is actually a vast amalgam of several territories, each of which meets specific political, financial, social or technological logics. Besides, the Latin American territory is not only geographically bounded: exiled or migrant artists, for instance, who work from abroad but looking away towards their identity of origin, should also be included within the context of Latin American new media arts. Because of all these factors, when we talk about the relationships between art, science, technology and society in the Latin American territory, we actually refer to several overlapped and interweaved layers, which flow between global and local, general and particular issues, regarding both the technologies and the territory. The selection of texts and art projects featured in this issue explores different sides of and possible approaches to new media art in and from Latin America. It delves into the factors and contexts that condition a particular relationship between art, technology and society; it explores how the development of these relationships has embodied in particular practices, experiences and proposals, and sets out challenges and draws possible solutions from the ground. In the texts section, Antonieta Clunes outlines a general framework about the relation between art and technology and its specific development in Latin America - particularly in Chile - which she finally embodies in her own low-tech art practice. For his part, Ricardo Dal Farra sets out an approach to the history of the encounters between music and technology in Latin America, reflecting about how history is actually constructed and the role played by institutions on this processes, as well as sharing his own contribution to the archive and conservation of the Latin American electroacoustic music. On this same historical thread, but focused on Bioart, Pablo Santa Olalla gets us close to the work by the Argentinean artist Luis Benedit, who explored the relationship between art and science during the 60bs and 70bs. Claudia Costa Pederson features Leslie García, a Mexican artist that, by means of recycled technological materials and participative processes - and, maybe, in a kind of update of what Dal Farra and Santa Olalla respectively exposed on their texts - works with sound experimentation through live organisms. Taking Net.Art as a starting point, Treva Michelle Pullen reflects also about the construction of its history in Latin America, approaching the hegemonic representations of this region and the artistic appropriation of the www as a possible means to subvert them. The Network is also the main topic of Thea Pitmanbs text: she sets out netweaving as a central concept to analyze how Latin American identity is constructed at the convergence between online cultures and traditional indigenous weaving, and explores these processes in the work of Latin artists living in the USA. The issue of indigenous identity is a keystone also for Clvaro Aroca Córdova, who submits a personal project that links art and science to recall ritual and sacrifice in indigenous Chilean cultures, and to rework these concepts from a de-colonial perspective. Yomara Rosero explores the videomapping scene in Ecuador: how has it developed in the country, which initiatives have encouraged it and which artists are working with this medium are the key contents of her text. Following also this local perspective, focused on Cuba in this case, Cristina Figueroa takes the particular context of connection-disconnection and control as a starting point to think about Cuban online art practices and to delve, particularly, into the development of Gamer Art. A different, but complementary approach to the digital art in Cuba, is the one provided by Yara Guasque, who analyzes its development in the light of the rising of Cuban art in the international collecting, the Cuban cultural policies or art events such as La Habana biennial or Salón del Arte Digital. Following Rosana Morato, we approach Bolivia from the point of view of the tensions that arise between the limitations of the educative programs regarding new media art, and the real context faced by artists and institutions. Also regarding education and the diffusion of new media, Jose Joaquín Benito Tejero exposes the task carried out by the Red de Centros Culturales de España throughout the entire Latin American territory to foster the integration of new technologies as creative tools in different social contexts. Following this idea of visibilization, but going back to networks and connectivity, the project Arttextum, featured by Frida Cano as its promoter, brings us closer the opportunities opened by digital networks, not only to rethink and strengthen the links that join together the different agents involved in the Latin American contemporary art system, but also to expand the reach of Latin American media art beyond any territorial border. Finally, collaboration and networking are also central concepts for Claire Taylor and Jordana Blejmar: they set out a series of observations and recommendations - which based on a project that joint together artists and institutions both from Europe and Latin America - regarding the exhibition spaces for digital art, the uses of social media for curation and the future possibilities for future Euro-Latin American collaborations. The art projects featured at the online exhibition delve into or expand - directly from art practice - some of the issues addressed in the texts section. Encoded Textiles by Guillermo Bert (text by Tressa Berman) shows a series of textiles weaved in collaboration with Mapuche communities. As a perfect example of netweaving, these textiles establish a particular dialogue between new technologies and cultural identity. Quinchahue by Clvaro Aroca gathers together, now as a gallery, the performative actions approached in his text. Je ne Sauviers by Andrés Salas shows his personal proposal to explore, by means of video-documentary, Colombian identity in exile trough 5 different stories. On his part, in La Vida en Cicloes, Juan Duque relies on low-tech sound recording technologies to look into the relationship between personal introspection and the environment. The project Protobody by Brisa MP shows how robotics and DIY logics can be used to explore body-movement-technology relationships, while first_contact by Axel Cuevas shows his research regarding the sonification of biological processes of a particular fungus and its transformation into an immersive experience exploring imaginary worlds. Kilohertz by Matin Reiche demonstrates the artist's ongoing research project regarding the electromagnetic spectrum in Brazil's rural areas, with their political implications, that relies on the installation of DIY sculptural antennas. Finally, with Retorno by Josefina Abara we will go across the poetic history of a failed project that reflects on the relationships that we stablish with technology. Although a line of reasoning could be traced to put together both the texts in the text section and the artworks in the online exhibition, the contents of this is issue are not linear or hierarchically organized according, for instance, to topics, art typologies or the specific territories referred. All the texts and artworks are somehow related to each other, and can be explored randomly. This structures works also as a metaphor of the context itself that we intend to analyze here: a hybrid context, full of interrelations and with several possible approaches. With no aim to give a complete or definitive vision about this abstract concept that is "Latin American new media art", the contents of this issue succeed in bringing us a bit closer to it. And, above all, together, are able to account for the folds and complexity that it entails. I would like to finish this editorial expressing my gratitude to all the authors and artists in this special issue - both if they replied to our open call or if they kindly accepted our invitation to contribute - for their participation and their collaboration during the editing process. My special gratitude to the partners - Red de Centros AECID, CEIArtE, Redcatsur, Proyecta y Lut Studio.Lab - that have contributed to make this issue a reality, not only with their support, but also with their texts. And finally, my gratitude to all the authors and artists that sent their proposals to take part in the call for papers of this issue and, of course, to the Interartive Team. On the one hand, we have seen many Latin American media artists step into the global-commercial circuit of new media art b see, as an example, the case of the Mexican artist Gilberto Esparza, who in 2015 was awarded with the Ars electronica Festivalbs Golden Nica, one of the most prestigious awards in the new media art world. Meanwhile, on the other hand, an increasing number of spaces for debate and analysis of these practices has arisen at international events (ISEA2010 RUHR Conference P32 Latin American Forum II: Current Media Art Practice / Curators and Organisers, ISEA 2012 Latin American Forum, Re-Create: Media Art Histories Conference 2015: Panel Pioneering Experiences in Art, Science and Technology in Latin America, etc.). We could mention also the increasing number of themed publications focused on this issue - see, for instance, the last issue Media-N. Journal of the New Media Caucus, bMestizo Technology: Art, Design and Technoscience in Latin Americab. Montero, Valentina, "La invención de América Latina en su dimensión geopolítica", en Arte de los medios y transformaciones sociales durante la transición en Chile 1990-2014. PhD Thesis, Universidad de Barcelona, 2015. About this process of new media art normalization, see: Quaranta, Domenico, Media, New Media, Postmedia. Brescia: Linsk Editions, 2013. Gómez, Marisa, ¿Qué es el New Media Art? Una Aproximación Terminológica, en Interartive #42, Abril 2012. Aspects such as the importance of Low-Tech or DIY, the utopic symbolism linked to the networks or the claim for blurred histories or identities - all with special presence on this issue - seem to give us a certain idea of how new technologies are specifically integrated, appropriated or processed.